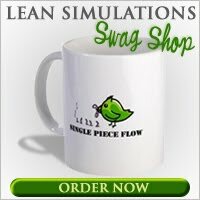 In an effort to make this blog easier to navigate, I've just compiled all the Lean videos I've linked to on this site. For ease of navigation, you can find a handy list in the side bar to the right, under the link Equally Massive List of Free Lean Videos. Naturally, I'll be adding to the list as I find new videos, so bookmark the video page and keep an eye on it for updates. Be sure to check out the list of free Lean games as well!